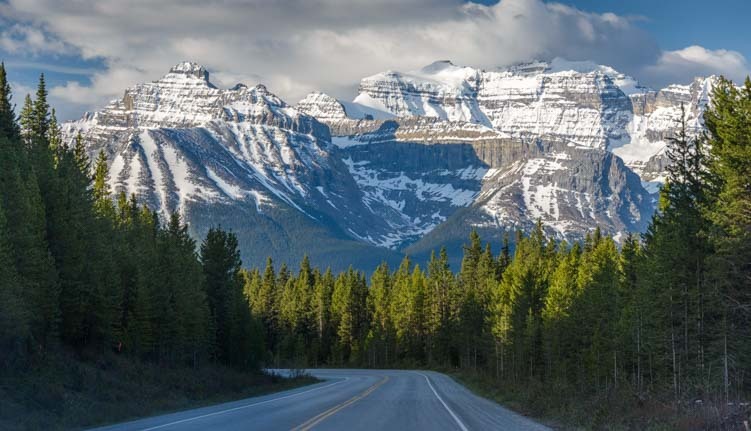 May 2016 – The Icefields Parkway is a 150 mile long scenic drive in Alberta, Canada, that goes between Lake Louise in Banff National Park at the south end and the town of Jasper in Jasper National Park at the north end. It is touted to be one of the world’s top scenic drives. And they aren’t kidding! 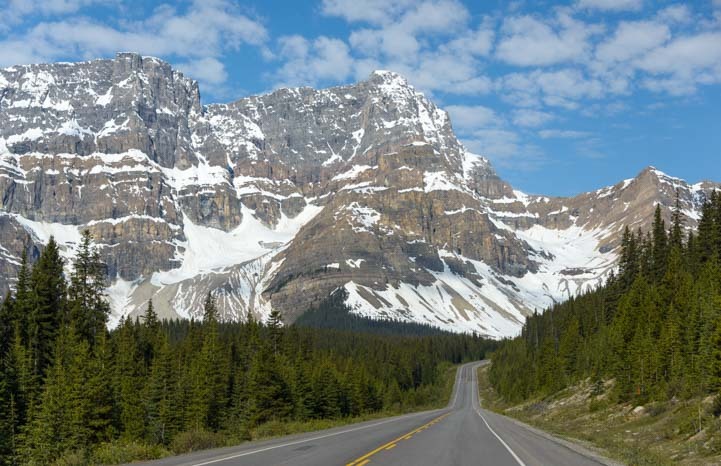 The Icefields Parkway is one of the world’s most spectacular scenic drives. 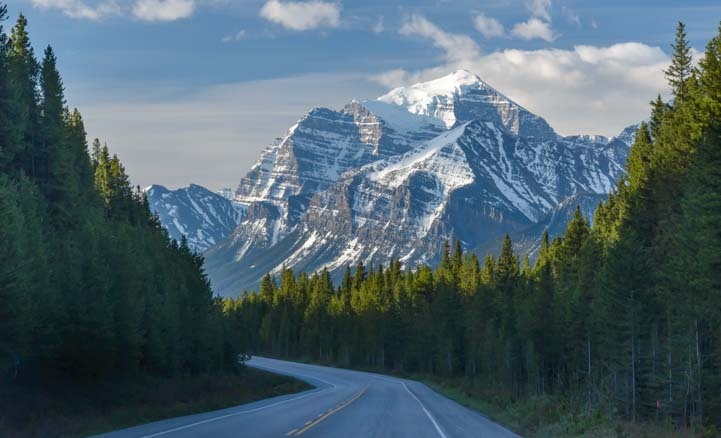 We drove the southern half of this eye-poppoing scenic drive several times during our stay in Lake Louise. We were blown away by the thrilling views every single time. The dramatic views never quit! The Canadian Rockies were right there all around us, nearly close enough to reach out and touch. 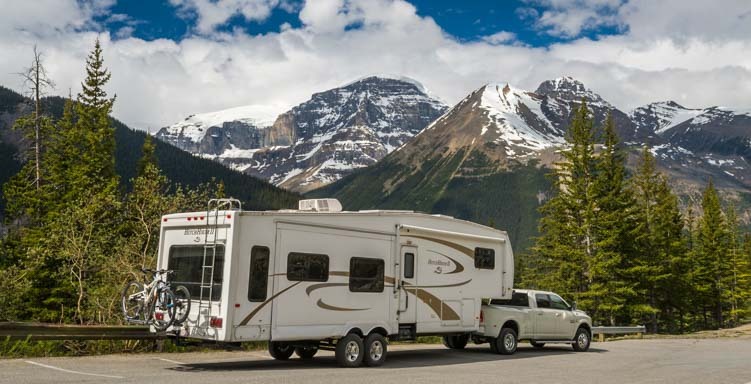 RVs are the most common vehicles on the Icefields Parkway. The mountains towered in front of us and behind us, and we kept jumping around in our seats looking in every direction out the windows, our jaws hanging open in amazement. The mountains changed shape and color constantly as we drove in the varying light of early morning, midday and late afternoon. 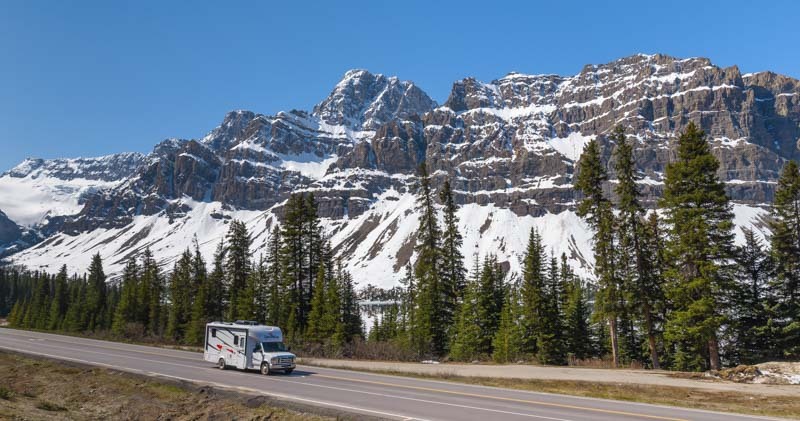 The magnificent Icefields Parkway provides a feast for the eyes while driving but, for its length, it has suprisingly few scenic overlooks and pullouts where drivers can stop to admire the breathtaking vistas. One of the best scenic viewpoints is at Herbert Lake. 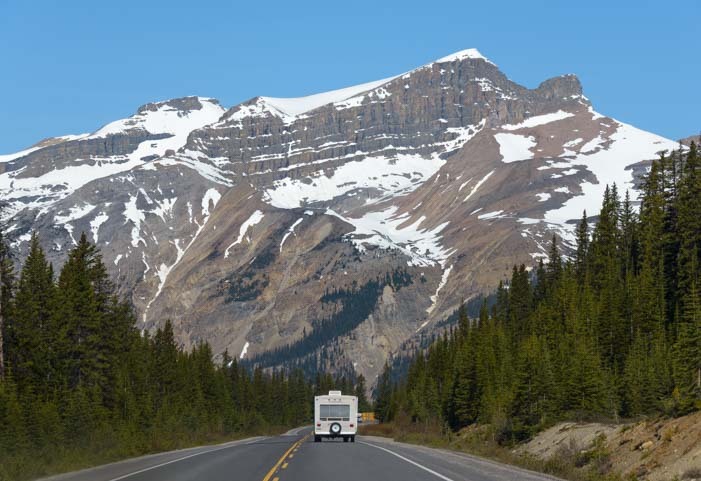 It is the very first pullout at the south end of the Icefields Parkway, and loads of drivers who start their drive at Lake Louise zoom right by. 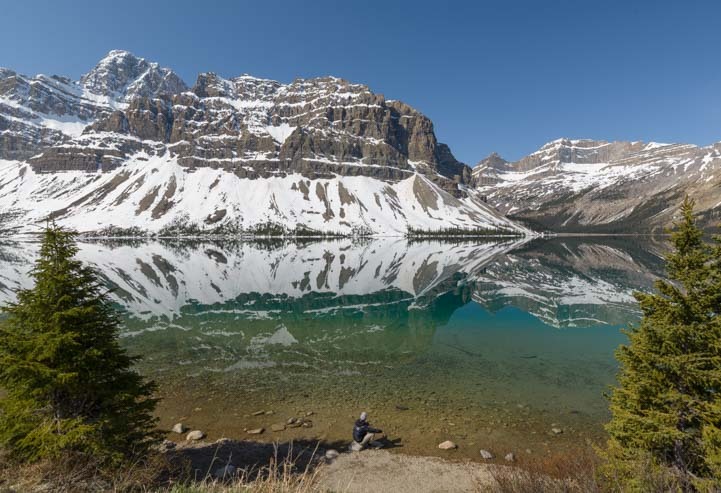 Herbert Lake – A gorgeous spot on the Icefields Parkway that many northbound tourists skip past! The temptation when you round the bend and pass Herbert Lake and first catch a glimpse of the mountains reflecting in the water is to think, “Oh, we’ll have lots of scenic viewpoints on this drive, and the Icefields Parkway is 150 miles long, so let’s keep going for a while and stop a little further down the road.” After all, you’ve been on the Icefields Parkway for all of about three minutes at this point! We zipped by the first time but made a point to stop there on several return visits. As I stared at the mirrored reflections in the lake one morning, I noticed the clouds were flying across the sky. So I set up a timelapse on my camera to capture the swift movement and variable light. What a cool result!! 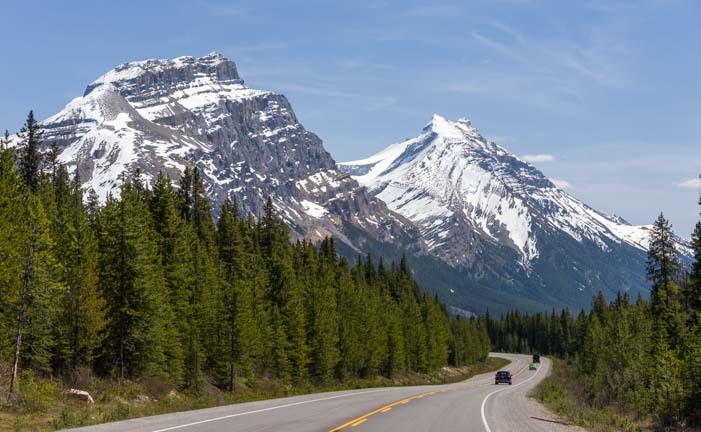 One day as we drove along the Icefields Parkway, we were craning our necks looking up at the mountains when we noticed a cluster of cars pulled over on the shoulder of the road. Everyone was pointing their cameras towards the woods. It turned out there was a black bear just in front of the trees. 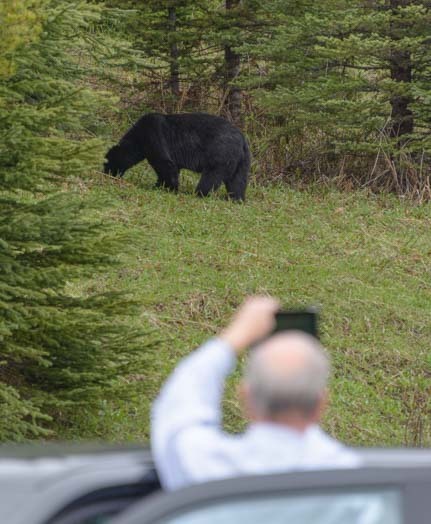 People stopped there cars to snap pics of a bear. What a beauty he was!! 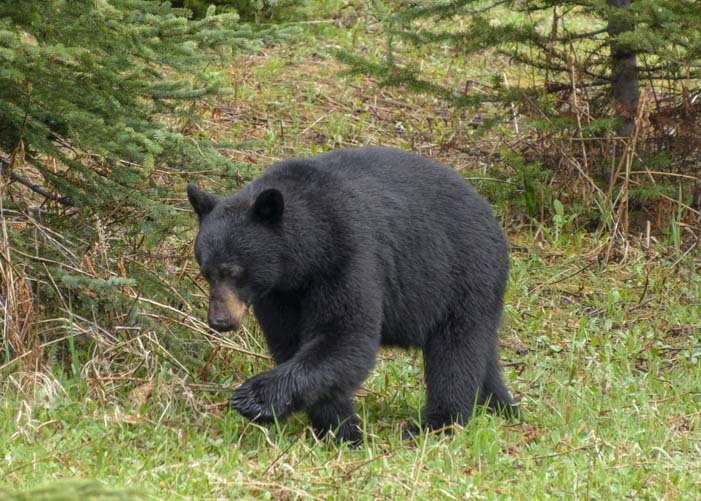 We were tickled to see a bear so effortlessly for a second time here in the Canadian Rockies. 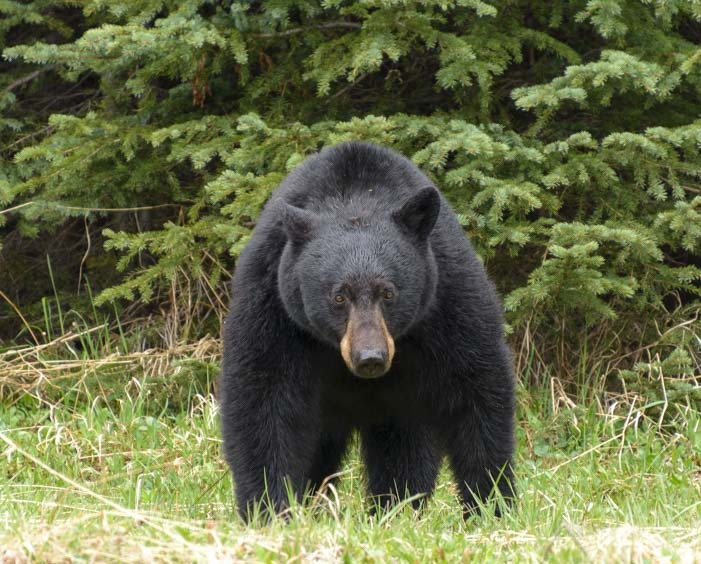 Another wonderful black bear sighting! 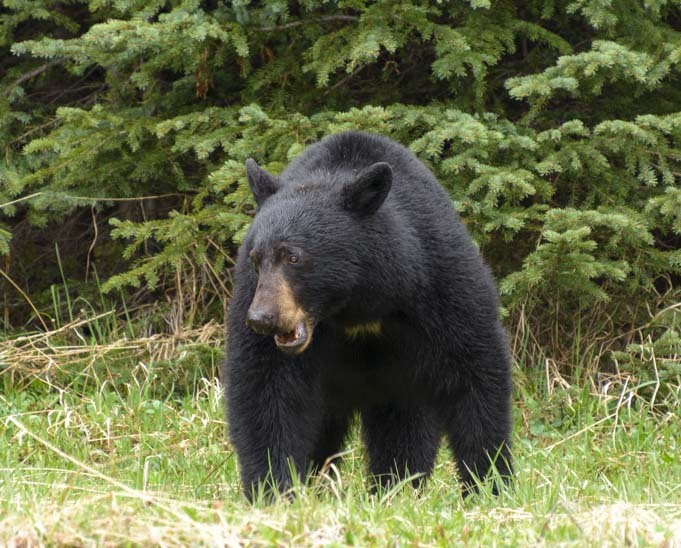 He stood still for a long time, chowing down on the grass, and our cameras clicked furiously. He stayed so long that his audience cycled in and out. Some folks got back in their cars and drove off and newcomers pulled over to park and stare in awe. 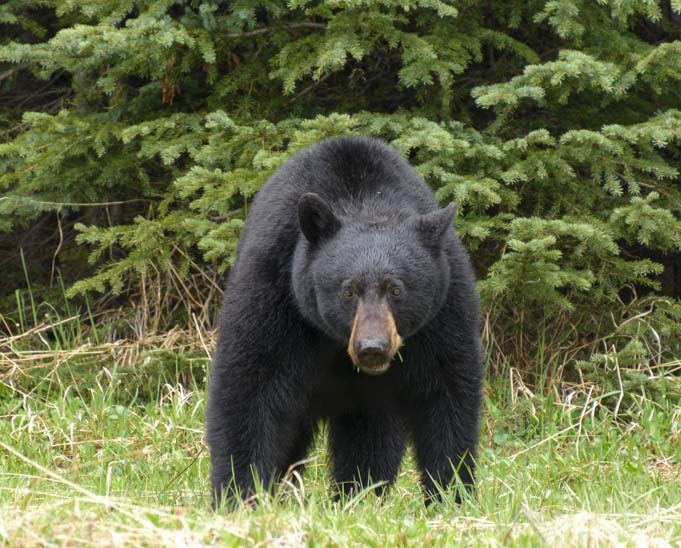 Finally, the bear lumbered off into the woods. 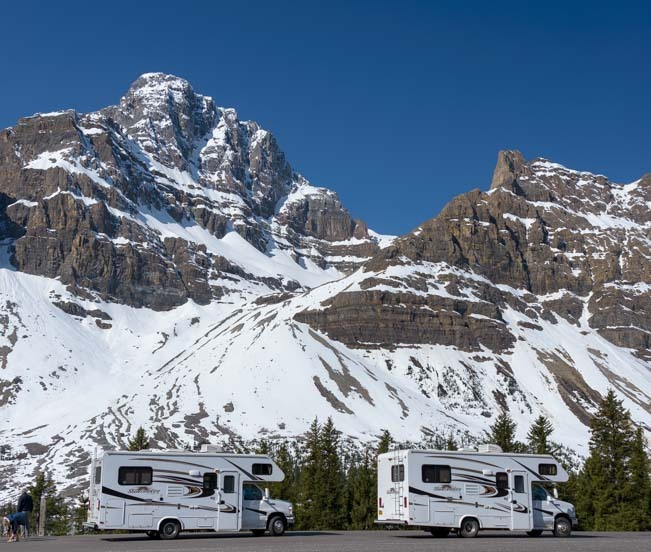 There are a number of dry camping campgrounds on the Icefields Parkway but most were closed, even in late May. We wandered through a few — what great spots to camp during the summertime! 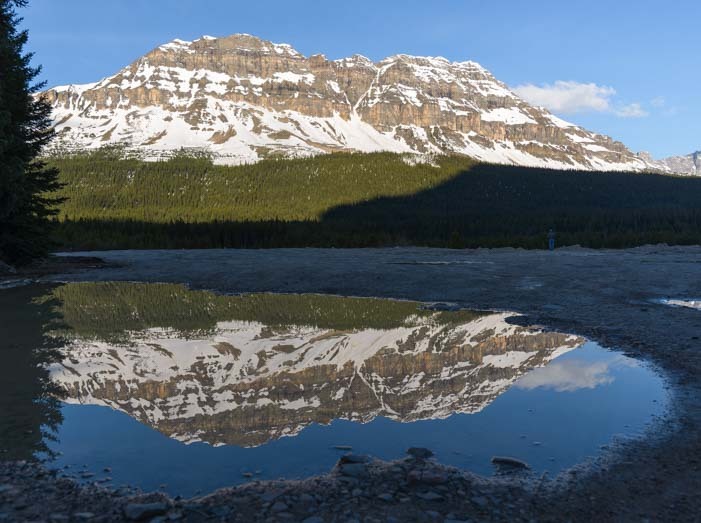 — and we discovered a lovely view of the Rockies reflecting quietly in a large puddle on the ground near Mosquito Creek Campground. Lots of RVs travel this highway, and we saw more rental RVs than any other kind of vehicle on the road. The Icefields Parkway was under construction in spots, so there were loads of big construction trucks driving very fast on a mission to get where they were going. In the early mornings, though, we had the road to ourselves. 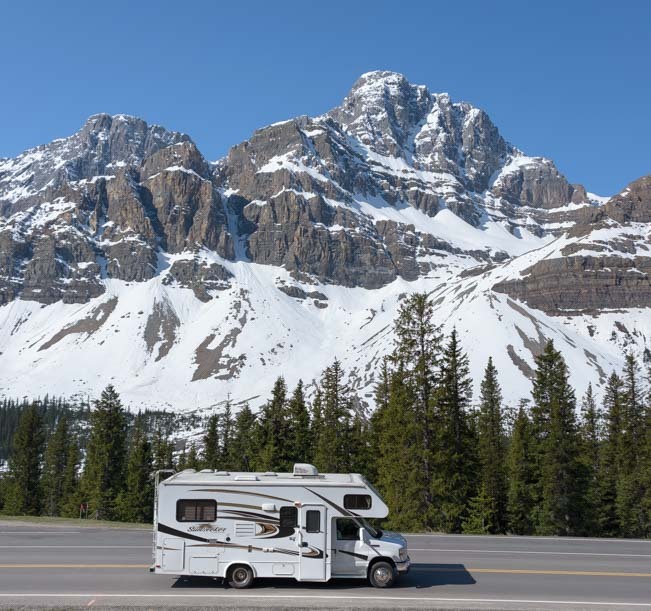 The Icefields Parkway is a popular spot to take an RV! One of the biggest and most popular scenic pullouts is at Bow Lake. This is a stunning lake, and we caught it in a mild mood one morning when it was as still as glass. The patterns of the snow on the mountains reflected beautifully in the green depths of the water. We loved the images the mountains created in the green water of Bow Lake. The pullout at Bow Lake is very large, and we hung out for an hour or so watching the tourists come and go. First there was one RV. Then the tour buses began to show up and park alongside the cars and RVs. There was a constant shuffle of vehicles coming and going and people running around the overlook admiring the exquisite view. 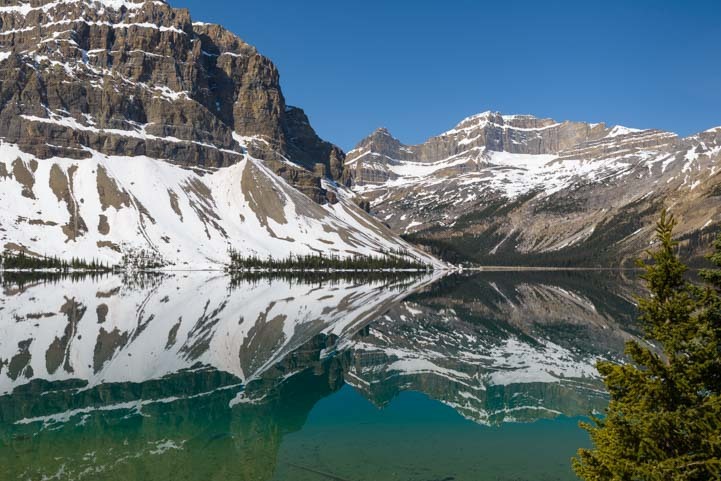 Bow Lake is the most popular pullout in the southern half of the Icefields Parkway. It was busy in the off season! Everyone wanted a selfie. Well, if you can’t lick ’em, join ’em! So, we got one too! Our original plan had been to drive the Icefields Parkway with our rig, going slowly from south to north, and possibly camping midway at the Columbia Icefields. We never got tired of views like these! But we soon found out that being 55′ long from end to end, we would have struggled to fit in most of the pullouts and in almost all the trailhead parking areas. 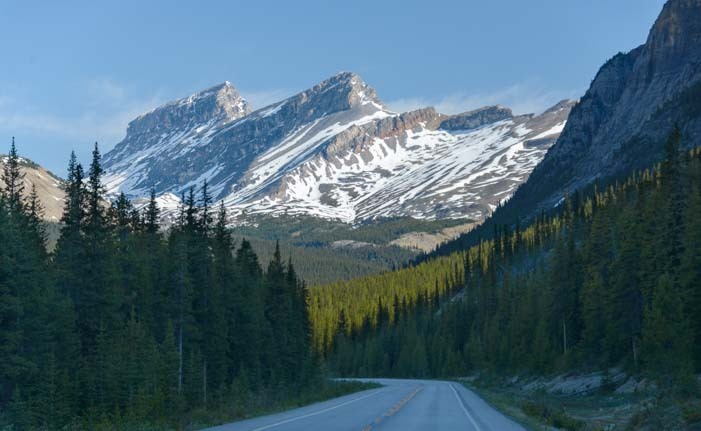 Icefields Parkway scenery – beautiful! 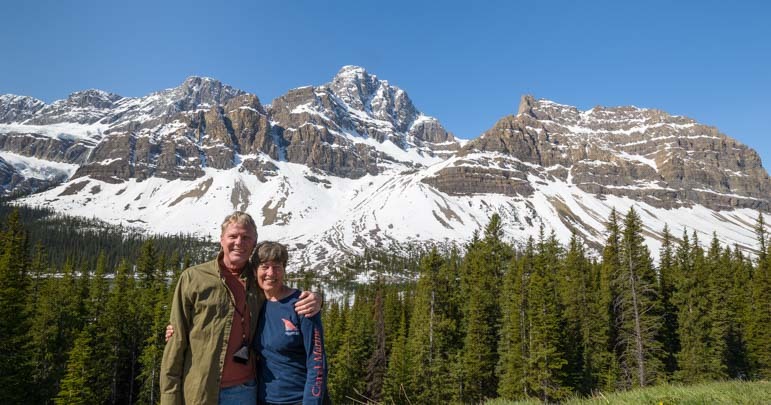 So, we drove the Icefields Parkway at leisure in our truck, stopping in different places each time we drove it, and never having to fight to squeeze a big rig into a tiny parking area. Eventually, when we were finally ready to go all the way to Jasper, we took our rig straight through without stopping. But there was a lot to see around Lake Louise and Banff first, so that story will have to wait! 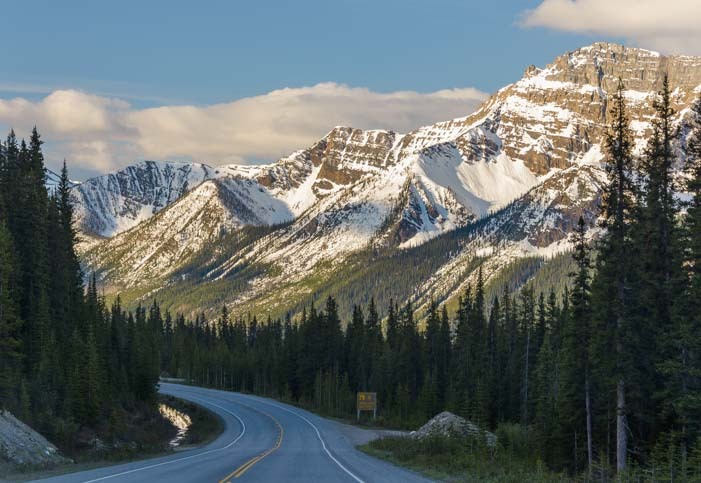 The Icefields Parkway is a glorious road, and it is an easy drive that doesn’t involve any hairpin turns or steep climbs. So it is very manageable for a big RV and tow vehicle/toad as long as you don’t plan to pull over too often. And the views… oh my, the views!! 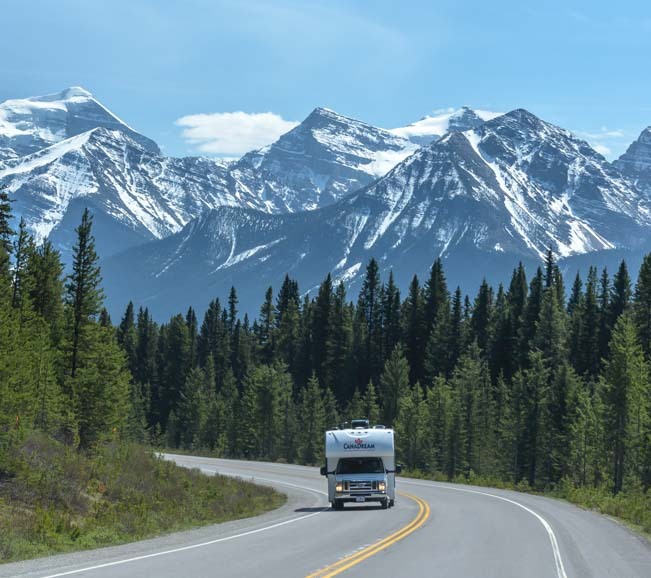 Canada RV travel tips – Border crossing, currency exchange, gas prices, etc. 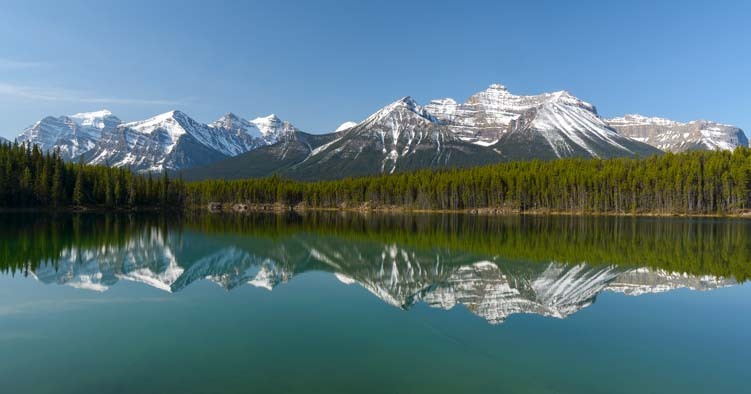 This entry was posted in Canada and tagged Canada, Canadian Rockies, Exotic Landscapes, National Parks Canada, New, Time-lapse Video, Top Scenic Drives, Travel, WP Travel by Roads Less Traveled. Bookmark the permalink. So glad you enjoyed our back yard! Alet’s us very diverse; hope you were able to enjoy a good bit of our Western hospitality. We loved it all, Brenda. You live in a gorgeous area!! We were there last year and loved it. You really captured the magnificence in your words and photos. Thanks for sharing. You are welcome! It is a stunning area that is a joy to visit!! Okay, that drive is now on our bucket list! Our house is finally under contract and closes by the end of this month! So after tying up a few loose ends, we will be ready for our full-time journey in a few months – woo-hoo! Congrats, Connie, and have a blast!! absolutely fabulous!!! Loved the time lapse! Thanks. It was a neat moment for a time-lapse!! Your time lapse photo is so cool! Great idea to drive the parkway without towing your rig so that you could enjoy it at your leisure. I couldn’t believe how fast the clouds were moving that day, Laurel, and it was neat to catch the movement with a timelapse! We’re glad we drove the Parkway a few times and saw it at different times of day and in different conditions (one time it was completely covered in fog and mist — very cool in its own way! ).